The genius of poetry must work out its own salvation in a man; it cannot be matured by law and precept, but by sensation and watchfulness in itself. John Keats (October 31, 1795 – February 23, 1821) was one of the principal poets of the English Romantic movement. And doubly sweet a brotherhood in song. Writh'd not of passed joy? Was never said in rhyme. Shed no tear! O shed no tear! The flower will bloom another year. Weep no more! O weep no more! Young buds sleep in the root's white core. Of pure ablution round earth's human shores. Are misery, and will not let them rest. Making him see, where Learning hath no light. Here lies one whose name was writ in water. My chest of books divide amongst my friends. Full of sweet desolation—balmy pain. The sweet converse of an innocent mind. The day is gone, and all its sweets are gone! Sweet voice, sweet lips, soft hand, and softer breast. I am certain of nothing but the holiness of the heart's affections and the truth of imagination — what the imagination seizes as beauty must be truth — whether it existed before or not. The imagination may be compared to Adam's dream — he awoke and found it truth. O for a life of Sensations rather than of Thoughts! I scarcely remember counting upon happiness — I look not for it if it be not in the present hour — nothing startles me beyond the moment. The setting sun will always set me to rights, or if a sparrow come before my Window I take part in its existence and pick about the gravel. The excellency of every art is its intensity, capable of making all disagreeables evaporate, from their being in close relationship with beauty and truth. At once it struck me what quality went to form a man of achievement, especially in literature, and which Shakespeare possessed so enormously — I mean negative capability, that is, when a man is capable of being in uncertainties, mysteries, doubts, without any irritable reaching after fact and reason. They will explain themselves — as all poems should do without any comment. Works of genius are the first things in this world. Nothing is finer for the purposes of great productions than a very gradual ripening of the intellectual powers. Poetry should be great and unobtrusive, a thing which enters into one's soul, and does not startle it or amaze it with itself, but with its subject. We hate poetry that has a palpable design upon us — and if we do not agree, seems to put its hand in its breeches pocket. Poetry should be great and unobtrusive, a thing which enters into one's soul, and does not startle or amaze with itself, but with its subject. Many have original minds who do not think it — they are led away by custom — Now it appears to me that almost any man may like the spider spin from his own inwards his own citadel. If Poetry comes not as naturally as the leaves to a tree it had better not come at all. In Poetry I have a few axioms, and you will see how far I am from their centre. I think Poetry should surprise by a fine excess and not by singularity — it should strike the reader as a wording of his own highest thoughts, and appear almost a remembrance — Its touches of Beauty should never be halfway thereby making the reader breathless instead of content: the rise, the progress, the setting of imagery should like the Sun come natural to him — shine over him and set soberly although in magnificence leaving him in the luxury of twilight — but it is easier to think what Poetry should be than to write it — and this leads me on to another axiom. That if Poetry comes not as naturally as the leaves to a tree it had better not come at all. Scenery is fine — but human nature is finer. Every mental pursuit takes its reality and worth from the ardour of the pursuer. I compare human life to a large mansion of many apartments, two of which I can only describe, the doors of the rest being as yet shut upon me. I am certain I have not a right feeling towards women - at this moment I am striving to be just to them, but I cannot. Is it because they fall so far beneath my boyish imagination? When I was a schoolboy I thought a fair woman a pure Goddess; my mind was a soft nest in which some one of them slept, though she knew it not. There is an awful warmth about my heart like a load of immortality. I begin to get a little acquainted with my own strength and weakness. Praise or blame has but a momentary effect on the man whose love of beauty in the abstract makes him a severe critic on his own works. I have written independently without Judgment. I may write independently, and with Judgment, hereafter. The Genius of Poetry must work out its own salvation in a man: It cannot be matured by law and precept, but by sensation and watchfulness in itself — That which is creative must create itself — In Endymion, I leaped headlong into the sea, and thereby have become better acquainted with the Soundings, the quicksands, and the rocks, than if I had stayed upon the green shore, and piped a, silly pipe, and took tea and comfortable advice. I was never afraid of failure; for I would sooner fail than not be among the greatest. I think I shall be among the English Poets after my death. The poetical character... is not itself — it has no self — it is every thing and nothing — It has no character — it enjoys light and shade; it lives in gusto, be it fair or foul, high or low, rich or poor, mean or elevated. — It has as much delight in conceiving an Iago as an Imogen. What shocks the virtuous philospher, delights the camelion poet. A poet is the most unpoetical of anything in existence; because he has no identity — he is continually informing — and filling some other body. A man's life of any worth is a continual allegory — and very few eyes can see the mystery of life — a life like the Scriptures, figurative... Lord Byron cuts a figure, but he is not figurative. Shakespeare led a life of allegory: his works are the comments on it. Nothing ever becomes real till it is experienced — Even a proverb is no proverb to you till your Life has illustrated it. I myself am pursuing the same instinctive course as the veriest human animal you can think of — I am, however young, writing at random — straining at particles of light in the midst of a great darkness — without knowing the bearing of any one assertion, of any one opinion. Yet may I not in this be free from sin? Call the world if you please "The vale of soul-making." I have two luxuries to brood over in my walks, your loveliness and the hour of my death. O that I could have possession of them both in the same minute. Some think I have lost that poetical ardour and fire 'tis said I once had- the fact is, perhaps I have; but, instead of that, I hope I shall substitute a more thoughtful and quiet power. "If I should die," said I to myself, "I have left no immortal work behind me — nothing to make my friends proud of my memory — but I have loved the principle of beauty in all things, and if I had had time I would have made myself remembered." You are always new. The last of your kisses was ever the sweetest; the last smile the brightest; the last movement the gracefullest. You might curb your magnanimity, and be more of an artist, and load every rift of your subject with ore. I can scarcely bid you good-bye, even in a letter. I always made an awkward bow. God bless you! Caught from the early sobbing of the morn. Pausing upon their yellow flutterings. Inconstant, childish, proud, and full of fancies. And open face of heaven. "Sonnet. To One Who Has Been Long in City Pent"
That falls through the clear ether silently. Of mighty workings in a distant mart? Listen awhile ye nations, and be dumb. The poetry of earth is never dead. "Sonnet. On the Grasshopper and the Cricket"
That my own soul has to itself decreed. ’Tis might half slumb’ring on its own right arm. To sooth the cares, and lift the thoughts of man. There is not a fiercer hell than the failure in a great object. The imagination of a boy is healthy, and the mature imagination of a man is healthy; but there is a space of life between, in which the soul is in a ferment, the character undecided, the way of life uncertain, the ambition thicksighted: thence proceeds mawkishness, and the thousand bitters which those men I speak of must necessarily taste in going over the following pages. They alway must be with us, or we die. Till it is hush’d and smooth! The clear religion of heaven! In every place where infant Orpheus slept. Upon the forehead of humanity. Of love, that fairest joys give most unrest. But ah! she is so constant and so kind. So many, and so many, and such glee. That large utterance of the early gods! As if the ebbing air had but one wave. The days of peace and slumberous calm are fled. That is the top of sovereignty. Knowledge enormous makes a God of me. But weep, and weep, that they were born so fair? Is — Love, forgive us! — cinders, ashes, dust. Spares the next swath and all its twined flowers. Then glut thy sorrow on a morning rose. Turning to poison while the bee-mouth sips. St. Agnes’ Eve — Ah, bitter chill it was! And silent was the flock in woolly fold. Flatter'd to tears this aged man and poor. The silver snarling trumpets 'gan to chide. The music, yearning like a God in pain. Asleep in lap of legends old. A poor, weak, palsy-stricken, churchyard thing. Rose-bloom fell on her hands, together prest. Her rich attire creeps rustling to her knees. As though a rose should shut and be a bud again. In blanched linen, smooth, and lavender’d. And lucent syrops, tinct with cinnamon. In Provence call'd "La belle dame sans mercy." In all the house was heard no human sound. And the long carpets rose along the gusty floor. These lovers fled away into the storm. Cool'd a long age in the deep-delved earth. Already with thee! tender is the night. But, in embalmed darkness, guess each sweet. To toil me back from thee to my sole self! Fled is that music: — Do I wake or sleep? What leaf-fringed legend haunts about thy shape? Pipe to the spirit ditties of no tone. Stanza 5. The final lines of this poem have been rendered in various ways in different editions, some placing the entire last two lines within quotation marks, others only the statement "Beauty is truth, truth beauty," and others without any quotation marks. The poet's final intentions upon the matter before his death are unclear. A very odd young man, but good-tempered, and good-hearted, and very clever indeed. What harm he has done in English Poetry. As Browning is a man with a moderate gift passionately desiring movement and fulness, and obtaining but a confused multitudinousness, so Keats with a very high gift, is yet also consumed by this desire; and cannot produce the truly living and moving, as his conscience keeps telling him. They will not be patient neither understand that they must begin with an Idea of the world in order not be prevailed over by the world's multitudinousness: or if they cannot get that, at least with isolated ideas: and all other things shall (perhaps) be added unto them. 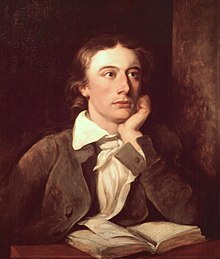 Here are Johnny Keats's piss a-bed poetry [...] There is such trash of Keats and the like upon my tables, that I am ashamed to look at them [...] No more Keats, I entreat: flay him alive; if some of you don't I must skin him myself: ther eis no bearing the driveling idiotism of the Mankin. The Edinburgh praises Jack Keats or Ketch, or whatever his names are [...] why, his is the Onanism of Poetry -- something like the pleasure an Italian fiddler extracted out of being suspended daily by a Street Walker in Drury Lane. This went on for some weeks: at last the Girl went to get a pint of Gin -- met another, chatted too long, and Cornelli was hanged outright before she returned. Such like is the trash they praise, and such will be the end of the outstretched poesy of this miserable Self-polluter of the human mind. Mr Keats, whose poetry you enquire after, appears to me what I have already said: such writing is a sort of mental masturbation -- he is always frigging his Imagination. I don't mean he is indecent, but viciously soliciting his ideas into a state, which is neither poetry nor anything else but a Bedlam vision produced by raw pork and opium. My indignation at Mr. Keats's depreciation of Pope has hardly permitted me to do justice to his own genius, which, malgre all the fantastic fopperies of his style, was undoubtedly of great promise. His fragment of Hyperion seems actually inspired by the Titans, and is as sublime as Aeschylus. He is a loss to our literature. Keats, entirely a stranger to error, could believe that the nightingale enchanting him was the same one Ruth heard amid the alien corn of Bethlehem in Judah; Stevenson posits a single bird that consumes the centuries: "the nightingale that devours time." Schopenhauer — impassioned, lucid Schopenhauer — provides a reason: the pure corporeal immediacy in which animals live, oblivious to death and memory. He then adds, not without a smile: Whoever hears me assert that the grey cat playing just now in the yard is the same one that did jumps and tricks there five hundred years ago will think whatever he likes of me, but it is a stranger form of madness to imagine that the present-day cat is fundamentally an entirely different one. In the latter part of that year’s summer  I first saw him. It was on the Hampstead road that we were introduced to each other…. …in that interview of a minute I inwardly desired his acquaintanceship, if not his friendship… He was small in stature, well proportioned, compact in form, and, though thin, rather muscular; — one of the many who prove that manliness is distinct from height and bulk. There is no magic equal to that of an ingenuous countenance, and I never beheld any human being’s so ingenuous as his. His full fine eyes were lustrously intellectual, and beaming (at that time!) with hope and joy. It has been remarked that the most faulty feature was his mouth; and, at intervals, it was so. But, whenever he spoke, or was, in any way, excited, the expression of the lips was so varied and delicate, that they might be called handsome. Keats was in childhood not attached to books. His penchant was for fighting. He would fight any one – morning, noon, and night, his brother among the rest. It was meat and drink to him. Jennings their sailor relation was always in the thoughts of the brothers, and they determined to keep up the family reputation for courage; George in a passive manner; John and Tom more fiercely. The favourites of John were few; after they were known to fight readily he seemed to prefer them for a sort of grotesque and buffoon humour. I recollect at this moment his delight at the extraordinary gesticulations and pranks of a boy named Wade who was celebrated for this.... He was a boy whom any one from his extraordinary vivacity and personal beauty might easily fancy would become great — but rather in some military capacity than in literature. He was called by his fellow students 'little Keats,' being at his full growth no more than five feet high.... In a room, he was always at the window, peering into space, so that the windowseat was spoken of by his comrades as Keats’s place.... In the lecture room he seemed to sit apart and to be absorbed in something else, as if the subject suggested thoughts to him which were not practically connected with it. He was often in the subject and out of it, in a dreamy way. He never attached much consequence to his own studies in medicine, and indeed looked upon the medical career as the career by which to live in a workaday world, without being certain that he could keep up the strain of it. He nevertheless had a consciousness of his own powers, and even of his own greatness, though it might never be recognised.... Poetry was to his mind the zenith of all his aspirations: the only thing worthy the attention of superior minds: so he thought: all other pursuits were mean and tame. He had no idea of fame or greatness but as it was connected with the pursuits of poetry, or the attainment of poetical excellence…. He was gentlemanly in his manners and when he condescended to talk upon other subjects he was agreeable and intelligent. He was quick and apt at learning, when he chose to give his attention to any subject. He was a steady quiet and well behaved person, never inclined to pursuits of a low or vicious character. He was under the middle height; and his lower limbs were small in comparison with the upper, but neat and well-turned. His shoulders were very broad for his size; he had a face, in which energy and sensibility were remarkably mixed-up, an eager power checked and made patient by ill-health. Every feature was at once strongly cut, and delicately alive. If there was any faulty expression, it was in the mouth, which was not without something of a character of pugnacity... The head was a particular puzzle for the phrenologist, being remarkably small in the skull; a singularity he has in common with Lord Byron and Mr Shelley, none of whose hats I could get on. And don't you remember Keats proposing 'Confusion to the memory of Newton' and upon your insisting on an explanation before you drank it, his saying, 'Because he destroyed the poetry of the rainbow by reducing it to a prism? Ah, my dear old friend, you and I shall never see such days again! I remember… his first introduction to Mr. Haydon; and when in the course of conversation that great artist asked him, "if he did not love his country," how the blood rushed to his cheeks and the tears to his eyes, at his energetic reply. His love of freedom was ardent and grand. He is studying closely, recovering his Latin, going to learn Greek, and seems altogether more rational than usual — but he is such a man of fits and starts he is not much to be depended on. Still he thinks of nothing but poetry as his being's end and aim, and sometime or other he will, I doubt not, do something valuable. He, who is gone, was one of the very kindest friends I possessed, and yet he was not kinder perhaps to me, than to others. His intense mind and powerful feelings would, I truly believe, have done the world some service, had his life been spared — but he was of too sensitive a nature — and thus he was destroyed! [Keats] was the very soul of courage and manliness, and as much like the holy Ghost as Johnny Keats. With Wordsworth, mortality is often just under the surface, as it was with Keats, another child of his time, who believed, because of the Enlightenment, that we are material beings in a material universe and that we must just accept that fate. We are mortal, but with no divine shoulder to lean on, and we will never understand the deepest truths, which, contrary to all the protestations of the Enlightenment, neither reason nor science can reach. Keats had a tragic sense of life. He is recognizably a Romantic; there is no Enlightenment Utopia waiting for him.